(Nanowerk News) An international study indicates the last interglacial period more than 100,000 years ago could be a good indicator of where the planet is heading in the face of increasing greenhouse gases and warming temperatures globally. 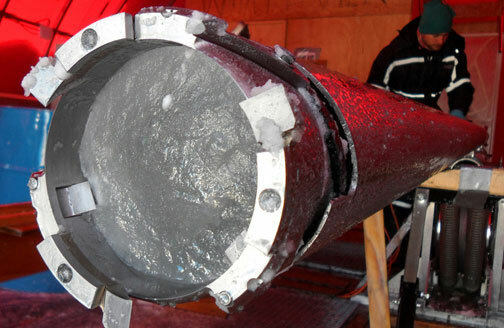 A core section of Greenland ice is prepared for removal from the barrel of the core drill. The ice samples, part of the North Greenland Eemian Ice Drilling project, are housed in freezers at the Centre for Ice and Climate in Copenhagen, Denmark. Despite the warmer climate during the Eemian, when seas were roughly 4 to 8 meters, or 13 to 26 feet, higher than today, the ice surface in the vicinity of the coring project was only a few hundred meters lower than its present level. That indicates the Greenland ice sheet may have contributed less than half of the total sea rise at the time. Edwin Waddington, a University of Washington professor of Earth and space sciences, is among 133 members of the drilling project who are coauthors of a paper published Thursday (Jan. 24) in Nature, which documents the findings. Previous coring projects in Greenland have been stymied in interpreting data further back than about 110,000 years, Waddington said, because deeper sections of Greenland ice were folded and overturned. “Even though it was clear that there was ice in those cores that was much older than 110,000 years, it could not be put into its correct context, and the published climate records all stop at about 110,000 years,” he said. In working with project leader Dorthe Dahl-Jensen of the University of Copenhagen, Waddington called on theoretical research he had done previously to demonstrate how folds could be created in the deep Greenland ice through subtle changes in the flow of the ice sheet going into and coming out of the last ice age. Subsequent radar imaging of folds deep in the ice in the area where the core was drilled showed that “the folds were also linked in some complex way to differences in stiffness or viscosity between the ice that fell as snow in the ice age, and ice that fell as snow during the previous warm period described in the paper,” Waddington said. Last year he led a National Science Foundation-funded project to detect variations in the crystal structures in the ancient ice using a tool that continuously measures the speed of sound over short intervals in the walls of the ice core hole as the tool is lowered on a cable. Subtle differences in the speed of sound allowed the researchers to detect variations in the fabric of ice crystals, variations that likely helped to create the folds. Having that information aided the scientists in placing the folded core layers in the proper order. That finding wasn’t a total surprise, said Jim White, an ice core expert from the University of Colorado Boulder and the lead U.S. investigator on the project. The researchers estimated the Greenland ice sheet’s volume was reduced by no more than 25 percent during 6,000 years. The rate of elevation change in the early part of the Eemian was high and the rate of mass loss from the Greenland ice sheet was likely similar to changes that have been observed during the last 10 years. The intense surface melt in the vicinity of the coring project during the warm Eemian period was seen in the ice core as layers of refrozen meltwater. Meltwater from surface snow had penetrated the underlying snow and then refroze. Such melt events during the past 5,000 years are very rare by comparison, the researchers said, which confirms that surface temperatures at the coring site during the Eemian were significantly warmer than today. Led by the University of Copenhagen and involving scientists in 14 nations, the team drilled more than 1.5 miles to bedrock in just over two years. The team extracted the first complete ice core record of the last interglacial period known as the Eemian. That provided past temperatures, precipitation and levels of atmospheric gases to better understand the current and future warming of Earth that virtually all climate scientists attribute to increases in human-produced greenhouse gases.